CANTON, Mass. (November 5, 2012) – Calling all ice cream lovers! Baskin-Robbins, the world’s largest chain of ice cream specialty shops, today kicked off its third annual Create Baskin’s Next Favorite Flavor Contest, which invites ice cream fans to concoct their own original ice cream flavors using Baskin-Robbins’ virtual flavor creator for a chance to have it featured in Baskin-Robbins shops nationwide in 2013. From now through November 30th, ice cream enthusiasts can become digital dessert chefs by visiting www.baskinrobbins.com/flavorcreator to virtually mix their own ingredients to create a new flavor. Visitors to the site can choose from dozens of base flavors, a range of ribbons such as fudge crackle or strawberry, and a variety of different mix-ins ranging from cake pieces to confetti sprinkles. New ingredients for this year’s contest include Salty Caramel, Milk Chocolate and Peanut Butter ice creams, Passionfruit, Triple Berry and Salty Caramel ribbons, and Pecans and Blondie Brownie Bites for mix-ins. This November, participating Baskin-Robbins shops nationwide will be featuring Nutty Cream Cheese Brownie, the winner of the second annual Create Baskin’s Next Favorite Flavor Contest, as the Baskin-Robbins Flavor of the Month. The winning flavor, created by Kelsey Lien of Santa Clarita, California, is a flavorful combination of chocolate fudge ice cream swirled with a cream cheese ribbon, combined with walnuts and fudge brownie pieces. The Create Baskin’s Next Favorite Flavor Contest is open to U.S. residents, 18 years of age and older. Once the contest closes on November 30th, Baskin-Robbins' executive culinary team will narrow down the submissions to determine the 20 finalists, who will receive free ice cream for a year. Ice cream fans will then vote online for their favorite flavor among the finalists to determine the winner. 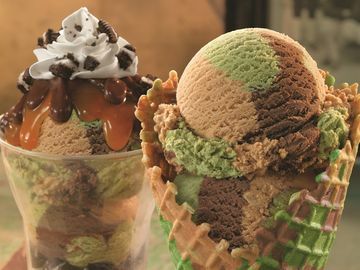 In addition to their flavor being featured in 2013 as a Baskin-Robbins Flavor of the Month, the winner will receive a trip for two to Los Angeles which includes a three-night stay at a landmark Los Angeles hotel, car rental, $1,000 in spending money and a trip to Baskin-Robbins’ West Coast training center where the winner will meet members of the Baskin-Robbins culinary team and spend a day bringing their virtual flavor to life. For more information and official rules, please visit www.baskinrobbins.com/flavorcreator. For more information about Baskin-Robbins and its Online Flavor Creation Contest, visit www.BaskinRobbins.com or follow us on Facebook (www.facebook.com/BaskinRobbins) or on Twitter (www.twitter.com/BaskinRobbins).